A well planned kitchen will make the "heart of the home" flow well and create an efficient, happy space that can save you lots of time and frustration. More than any other room in the home practicality is of utmost important when it comes to designing your kitchen. Here are some tips to consider when planning your kitchen. 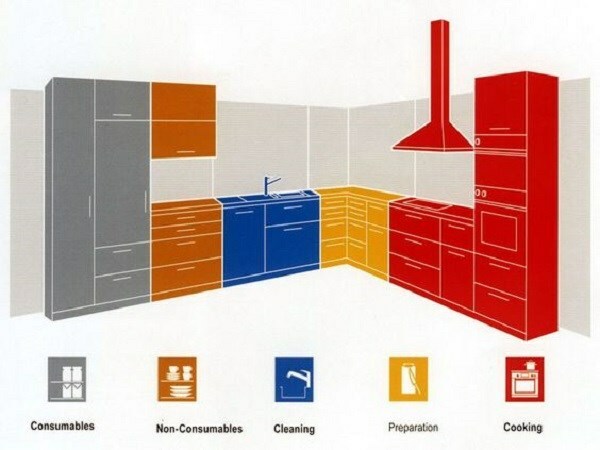 The following zones will be needed in your kitchen. When planning a kitchen a good start is to decided where each of these zones would work practically. Cooking Zone: Oven, hob, extractor, microwave, work space for preparation and putting down hot pans. Tip: Ensure the cooking zone is not in a pathway to a door. Tip: Consider positioning the dishwasher, sink and bin in a row for easy access. Storage zone: Fridge, pantry/food storage, cupboards and drawers for cutlery, dishes, glasses, pots and pans. Tip: Placing the cutlery and china near the dishwasher will make packing them away easier. Dining Zone: An informal eating area which could also be used as a serving area. Tip: This could be an island unit. 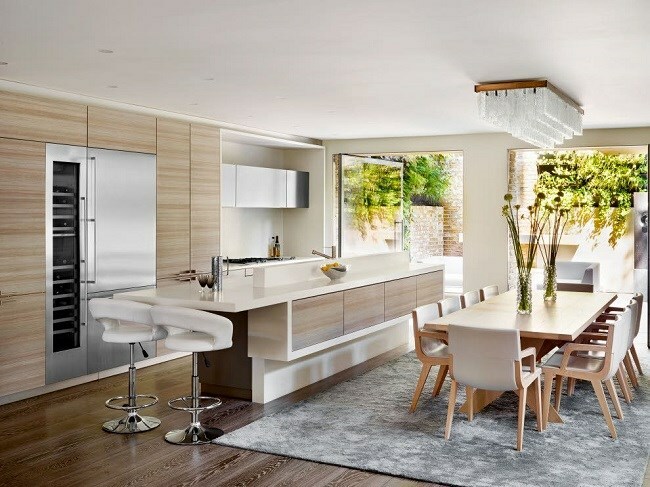 An inline kitchen runs along a single wall and is common in smaller kitchens where the kitchen is integrated with the dining and sitting rooms. Can be used in both small and large kitchens. Two parallel runs of units separated by at least 1.2 metres of floor space to allow for easy access and moving around in the kitchen. 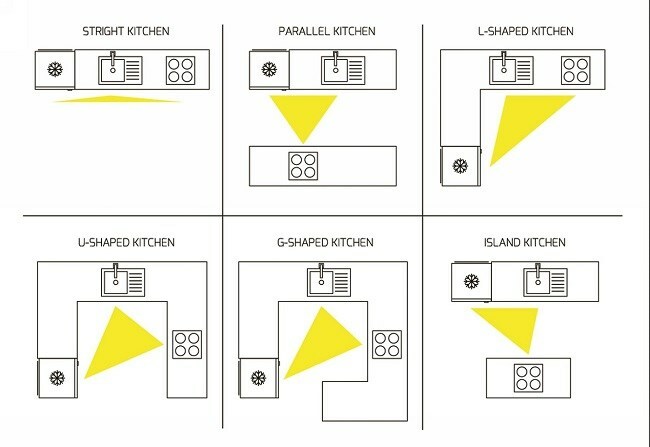 Many chefs like this layout as it allows you to locate appliances on each side a short distance apart. Composed of two adjoining kitchen runs. The one is usually longer than the other. A kitchen island can be a stylish addition to these layouts but this does increase the need for space. Ideally an island should be located at least 1.2 metres away from the rest of the kitchen to allow for circulation space. A well designed kitchen will make allowances for a work triangle, this is made up of the hob, sink and refrigerator. This is because the most common journey made in a working kitchens is between these three areas and the idea is to save time and be more efficient. If you draw an imaginary line between these three points you have a triangle. As a guideline it is recommended that the overall lengths of the triangle should not exceed 7 metres in total when added. Ideally the distance between the different working points is around 1.9 metres. Choosing the style of the kitchen is a personal one and will be influenced by the style of the property, budget and most importantly family taste and style. Here are some of the most recognized kitchen designs. Classic kitchens have clean lines, with a mix of traditional and contemporary materials. Here you would include the popular shaker style with natural timber and painted cupboards. Minimalist with clean lines and no mouldings. Handleless units or integrated handles. Fashionable timbers and processed materials. Integrated appliances. Open shelving, dressers. Mouldings with pelmets. Timber and naturals finishes. Painted cupboards. While kitchen renovations add a great deal of value to your property, the cost can quickly get out of hand. Follow these tips to help you stick to the budget. Keep disruption and costs to a minimum by carefully planning your home renovation before you begin. A kitchen renovation can add lots of value to your property, but can also be very stressful. Here are some tips to help you survive the chaos of a kitchen revamp.